MSF search and rescue operations were coordinated by the Maritime Rescue Coordination Center (MRCC) in Rome and comply with the law at all times. In line with the international maritime law, all rescue operations at sea happened under the coordination of an MRCC (in this case the Italian Coast Guard Centre for the Coordination of Rescue on Sea). We patrolled in international waters at around 25 nautical miles off the coast of Libya during the day, only moving closer to territorial waters if we were instructed to do so by the MRCC or we become aware of a boat in distress. At night, we operated in international waters at 30 to 35 nautical miles from Libya. Of course, we are aware that by doing this we are entering a very contentious political debate in Europe. But we believe that inaction cannot be justified on ideological grounds and that, in fact, as a medical organisation that takes its cues from medical ethics, we must take action. 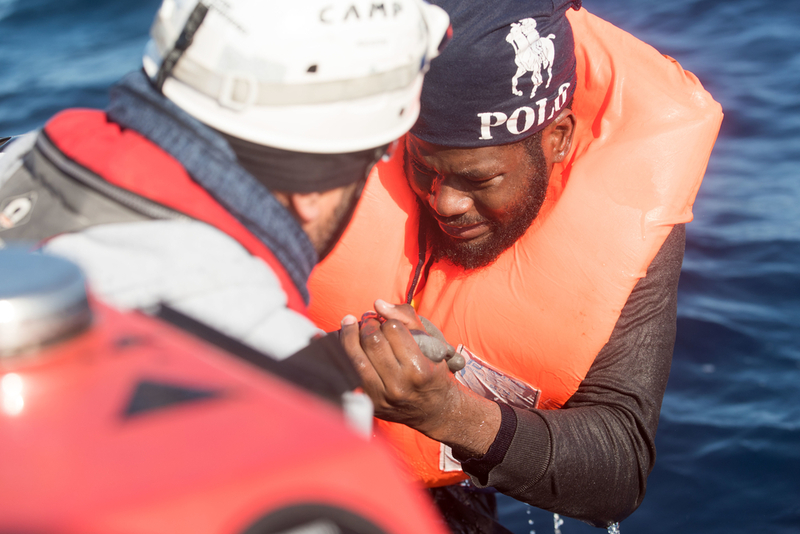 In 2017, MSF continued its search and rescue operations to assist refugees, asylum seekers and migrants on the perilous central Mediterranean Sea route, while facing increasing political and operational challenges. According to the International Organization for Migration, at least 2,835 people drowned while attempting to cross from Libya to Europe by sea in 2017. The UN migration agency also noted that the number of people rescued and brought to ports of safety in Italy in 2017 was the lowest for four years – around 120,000. The fall in numbers departing from Libya was hailed as a success by some, as it meant fewer lives would be lost at sea. However, the decrease was a result of agreements between Libya, Italy and the EU as part of a broader strategy to seal off the coast of Libya and ‘contain’ refugees, asylum seekers and migrants in a country where they are exposed to extreme and widespread violence and exploitation. The EU-supported Libyan coastguard scaled up its activities in international waters, intercepting refugees and migrants and bringing them back to Libya. Although these activities are presented as ‘rescue operations’, migrants and refugees are not being returned to a port of safety. On numerous occasions, Libyan coastguard vessels displayed threatening and violent behaviour towards unarmed NGO vessels carrying out search and rescue operations. In May, MSF witnessed a Libyan coastguard vessel firing gunshots into the air as it approached a boat in distress, further endangering the lives of refugees and migrants on board. In an increasingly hostile environment, in which politicians in Italy and other European countries attempted to undermine public support for search and rescue, NGOs faced unfounded accusations of collaboration and collusion with traffickers. The code of conduct proposed by the Italian Ministry of Interior legitimised a long-running political campaign to discredit and scapegoat NGOs who already operated within a clear legal framework and in line with all national, international and maritime laws. A rescue ship was impounded in Italy pending legal proceedings and a nationalist vigilante group even chartered its own boat for several weeks in order to actively disrupt lifesaving activities. 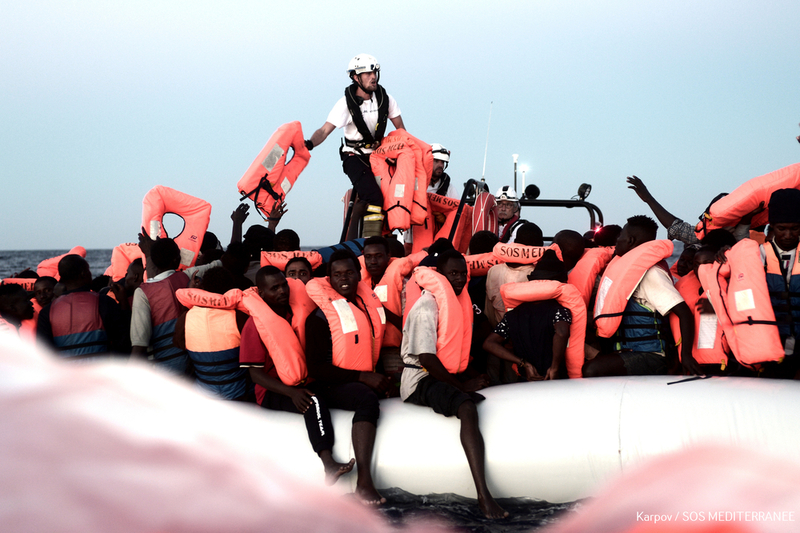 Despite this, MSF teams on the dedicated search and rescue vessels Prudence and Aquarius (the latter run in partnership with SOS MEDITERRANEE) were able to rescue 23,852 refugees and migrants from unseaworthy boats and bring them to a port of safety in Italy in 2017. As a result of the drop in the number of boats reaching international waters, MSF decided to temporarily suspend its boat Prudence in October. MSF doctors treated people for injuries they had suffered while in Libya and heard their accounts of violence and abuse. Many patients also had severe skin infections or chemical burns, and during the winter months, the team saw numerous cases of hypothermia. Over 10 per cent of all women rescued were pregnant. Two babies were born safely on board the MSF ships, and were named Mercy and Christ. The team also recovered 13 dead bodies.